Play your favorite Wii Sports games on the Wii U console! 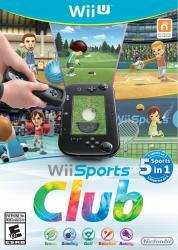 With Wii Sports Club, you can now take the competition online* with tennis, bowling, golf, baseball and boxing. Join a club, compete against other clubs from around your region, or play online multiplayer with your friends. You can also use all-new training modes to improve your skills and support your club.